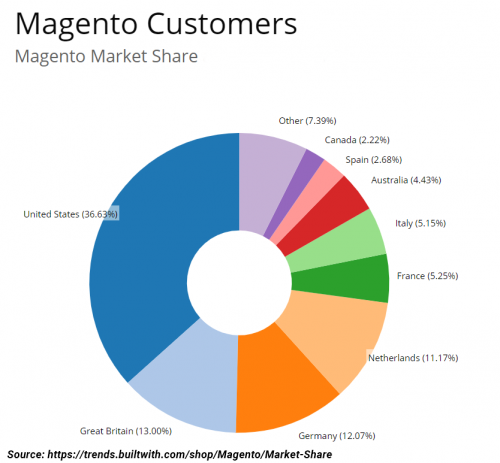 Magento 2 vs BigCommerce: Which Platform Will Merit a Prize? Aligning all your commercial software into one holistic ecosystem is going to shape B2C and B2B sectors in the upcoming year. eCommerce platforms powered up with the cognitive approaches like AI, deep and machine learning can significantly contribute to the online business development. However, it’s not an easy task to choose a decent SaaS that complies with your very eCommerce needs. There is a plenty of platforms have recently mushroomed helping manage a standard web store. Since each of them is fighting for its own market share, they might have a slightly different number of functions and capabilities. According to Datanyze, a technographics provider, the eCommerce landscape has already witnessed more than 400 software solutions. So no wonder that the uninitiated have to face tough challenge to pick the right one. That is why, we have decided to showcase you just two of the eCommerce platforms that see the popularity rise in recent years. Let’s take a short walk through the platforms’ descriptions and at the same time, see the geolocation pie charts to learn where these solutions are mostly employed. Magento is an enterprise-class eCommerce platform with an open source. It provides the retailers with smart tools for marketing, management, content creation, pricing, fulfillment by a wide range of third-party integrable extensions and customizations. The latest version of Magento has been released in 2015 and is known as Magento 2. More than 200,000 online merchants have Magento solutions implemented on their web stores. It offers its online users even more flexible and tech-enabled functions to operate their businesses. As well as its predecessor this new version has both free and paid options to choose between. So you can pretest its functionality to a certain extent before leaning to definite apps and extensions. 1) Adjustable architecture. It helps you build a flexible eCommerce project and tailor it to your own needs. 2) Business effectiveness. Magento 2 provides enhanced experience for retailers that can drastically drive traffic and initiates revenue growth. 3) Customers engagement. Due to its optimized and appealing characteristics Magento 2 guarantees a stable customer engagement increase on any device. 4) Scalability and performance of the eCommerce store. Magento 2 has acquired agility, better that it used to be on the older version. It gives a higher loading and caching page time, which it turn results in positive customer feedback and engagement/retention rate. Eventually, you will receive higher conversion. 5) Smooth update procedure. New capabilities enable smart and intuitive updating process. It allows you to easily upgrade any of the Magento 2 modules in no time. 6) New payment security standard. New version is equipped with embedded third-party payment services like Authorize.net, Braintree and PayPal. It definitely contributes to a higher level of cybersecurity for your online customers. 7) Smart backup and restore system. Due to the renewed algorithm, Magento 2 has a set of useful functions to timely backup all your eCommerce data in the blink of an eye. Also, you can safely restore the information when it is required, so you never suffer from data loss. 8) Flexible migration procedure. Magento 2 has got an in-built instrument that assists you to easily migrate from older versions to Magento 2.0. This tool ensures all your setting, catalog and customer data will be transferred safe and sound and takes no much time to move onto the newer version. 9) Scalability. Thanks to advanced architectural organization, you can cluster your system into smaller subsystems in order to improve web store performance, load speed and stability. Reallocate your payment, sales, shipping and delivery modules to be hosted on different servers according to online business needs. 10) Improved operability check. Magento 2 provides profound testing mechanism for facilitating smart self-diagnosis procedure. It helps smoothly reveals and fix various bugs, check different functional areas and fine-tune the overall performance. Here is also an article for you to help get accustomed with some of the Magento 2 extensions that have proven their efficiency in 2017. 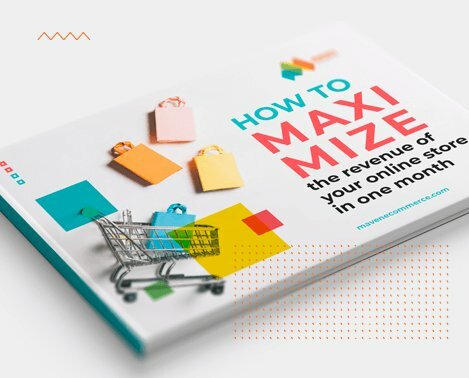 These eCommerce extensions can help you drive more traffic to your web store, enhance selling operations, SEO and marketing campaigns. All it makes Magento 2 a perfect eCommerce platform since you can easily pick only the functions that you really need for your web store. For more product details on this eCommerce platform, please, visit Magento. 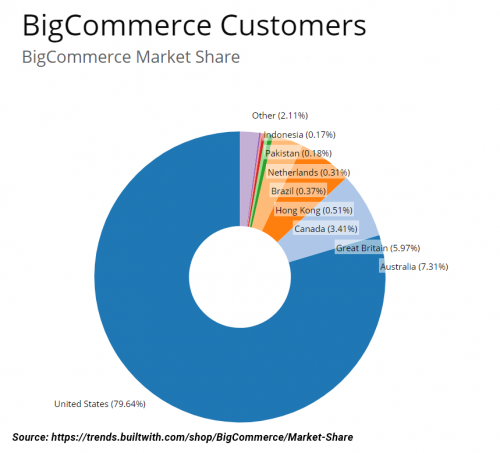 Although BigCommerce has offered only a paid version of its eCommerce platform, the number of its online users accounts for over 133,000 worldwide. BigCommerce provides its solutions for both emerging and grown-up businesses, making it’s fast and easy to get the platform installed and be operated on. The BigCommerce website info states that you will have all the advanced features to build your own online shop. It can help you streamline business process, look more competitive and optimize online sales. 1. Popularity. As it has been shown in the number of online merchants utilizing these eCommerce platforms (though we presume that some stats may vary a bit and depend fully on authors of the respective articles and infographics). In the meantime, Google Trends has demonstrated higher interest in online searches on solutions offered by Magento team. 2.Pricing. One of the advantages Magento has got over its competitors is available paid and free of charge plans fitting both B2C and B2B customers. Here we are not going to compare Magento Enterprise version cost and capabilities, since it is pretty pricey and designed to cater to large-scale enterprises. In the meantime, Magento Community variant is free and ideal for small and mid-sized online businesses. BigCommerce in its turn, offers the minimum plan that will cost you $29.95 per month. 3.Hosting. This is actually the main difference between these platforms. BigCommerce supports hosting services for its solutions, whereas Magento is a self-hosted eCommerce platform, meaning that integration services are provided by third-party vendors. These quite opposite strategies let online retailers decide the most appropriate variant to fit their needs. Whether to oft for certain features to get tailored according to web store specifics or not to pay for hosting on a regular basis. In case you feel like learning more about integration solutions to build an efficient eCommerce platform for your online store, please, contact us right away.